Hi guys. For today's afternoon post I have something a little different, but right up your alley. Especially for those of us with not a lot of time on our.. errr.. nails! Bad pun, I know. But that aside, I received the elusive Minx Nail Wraps to review and share with you guys. Minx Nails has been featured in a lot of fashion magazines and worn by celebrities as well so my curiosity was definitely tickled from the get-go. Not many know this but before I had to time to devote to nail art, I would wear nail wraps every single day. Every now and then I think we all get into that 'can't stop too much to do' timeframe so having good nail wraps handy is always nice. 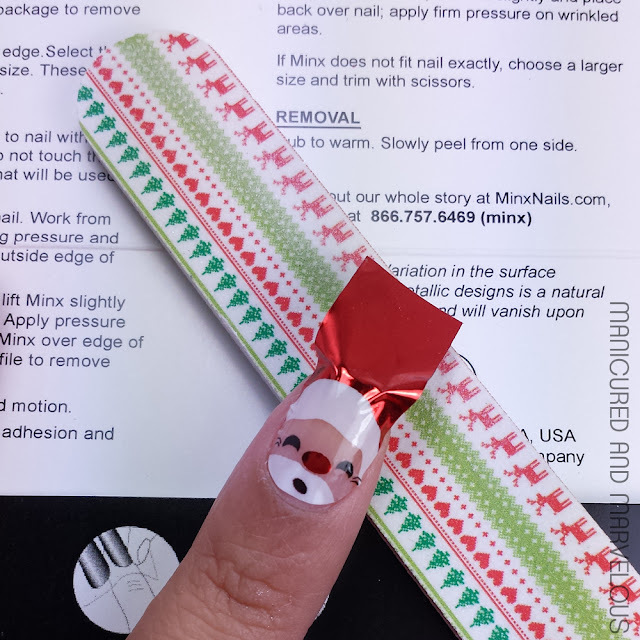 Minx Nail Wraps released three limited edition wraps just in time for the holidays. 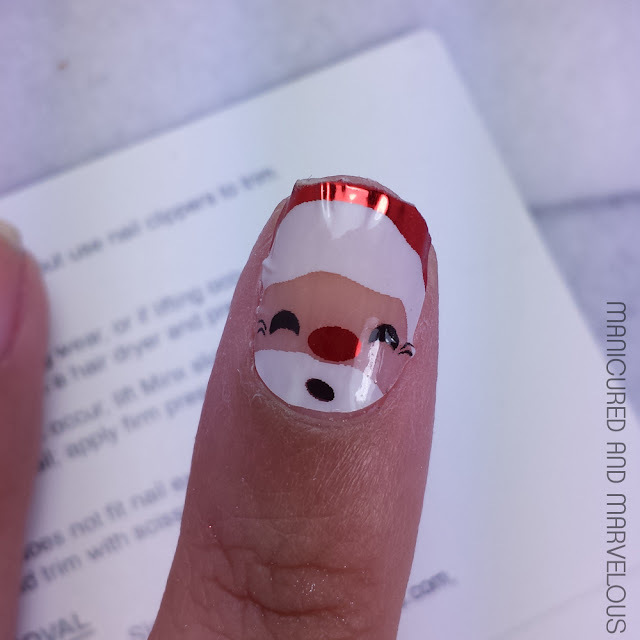 The new winter themed line of nail wraps are easy to apply and give you the perfect festive touch. 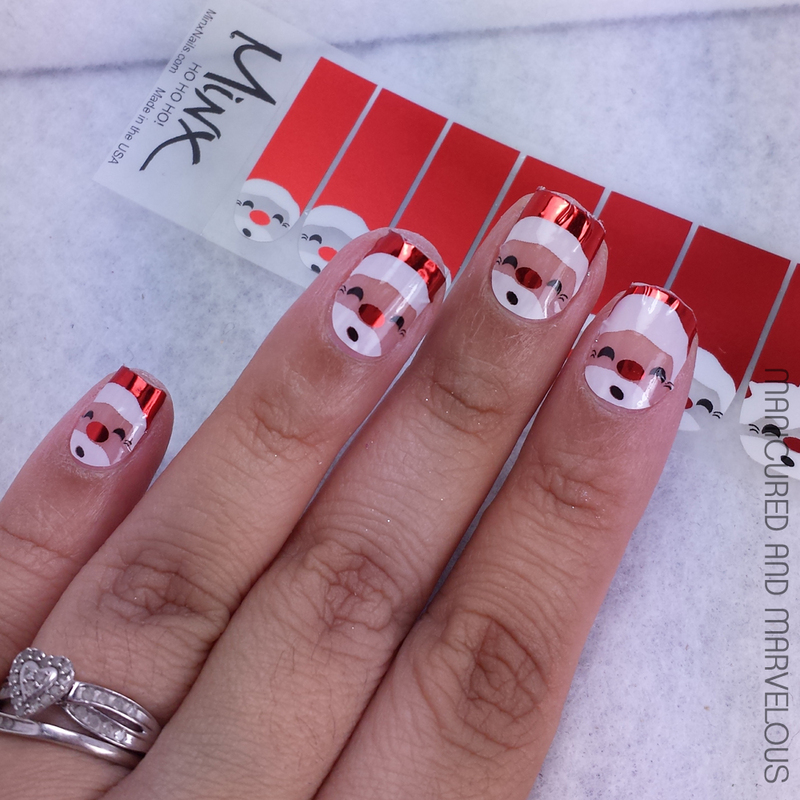 I'll be showing you guys the Santa Claus nail wraps and how I applied them to my nails. The packaging was includes two sets of eight wraps in various nail sizes and two pouches of alcohol prep swabs. Included on the envelope are thorough instructions on how to use the wraps on your nails or if you want on your toes as well. The first step is to make sure your nails are nice and clean of polish, oil, and dirt. 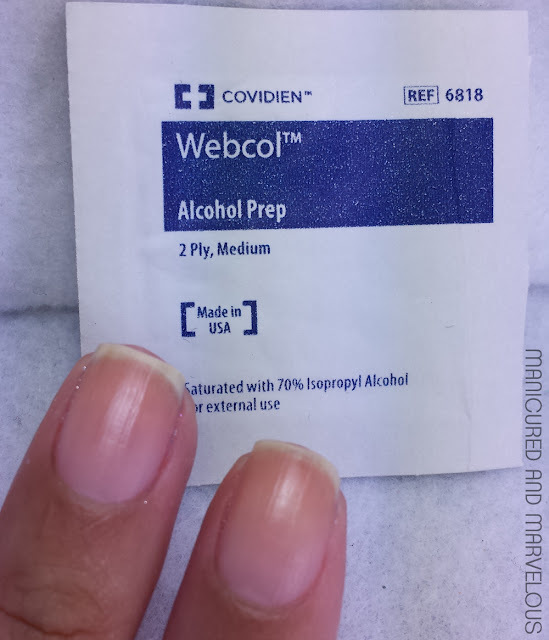 Remove your polish and then simply use the provided alcohol prep swabs to get nice clean nails. Before you get started on peeling off your nail wraps from the plastic there are two things you need to do. First select the sizes that you'll be using by measuring the wraps up to your cuticles. Secondly, you'll need to warm these wraps up! I'm naturally very cold so I used the hair dryer to wrap up the wraps for about three to five minutes. I know it may seem a little odd, but the reason you want them warmed up is for longevity with wear time. Now it's time to apply! After selecting the wrap that best suits your nail size, press it against your nail bed. Remember the round portion is meant to be directed at your cuticles. Slowly stretch it and smooth out the wrinkles. If you need to, lift it off your nail and reapply to make sure there are no wrinkles. 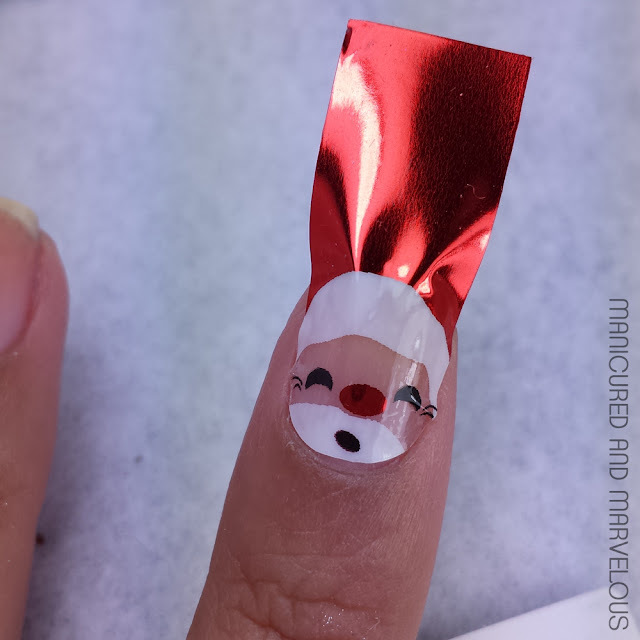 Now grab your nail file because it's time to trim down the wrap to the couture of your nail. You can trim the excess a bit if you prefer so that you don't have to do so much filing. Also be extremely careful not to file off your own nail during this process. Definitely not perfect on my first go, I can't lie. Take your time! It can be easy to rush and end up messing up and tearing the wrap. And make sure you smooth it down well or else the wrinkles will show (like mine). Now it's time for the rest of them! Repeat the same steps on the rest of your nails one-by-one. And you don't even need to topcoat it! 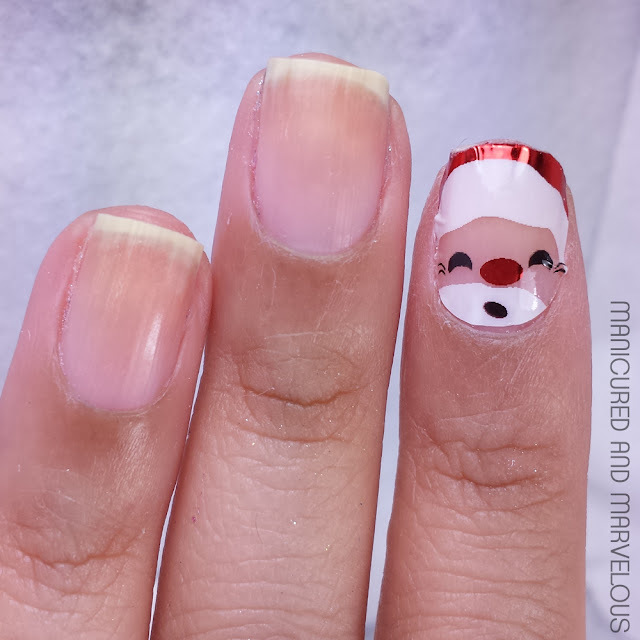 In a matter of fifteen minutes if not less you'll have yourself a beautiful mani to party it up during the holiday season! These are supposed to last up to 14 days, depending on how well you applied them (how much heat you used, etc) and will not smudge or chip. Overall I really like these nail wraps and I can see them being really handy this last week before Christmas. In terms of usability, it's really easy if you have some sort of prior experience. By the third finger I had it down pat and the rest of my nails looked a lot smoother than the first two. If you're completely inexperienced to nail wraps, I wouldn't suggest starting off with these. You wouldn't want to mess up and waste such beautiful high-end wraps just for practice. Another thing I'd like to mention is I do think they fit better if your nails aren't complete nubs like mine are at the moment. Your nails don't have to be super long or anything, but I do feel like these would of looked better on me a few weeks ago before my break. That said, I definitely recommend you guys give these a try. They are available for purchase for $18 each at all Beauty Collection Locations. So tell me guys, what's your experience with nail wraps been like? Let me know down in the comments. Thank you :) I thought so as well. And they lasted so long without chips too.